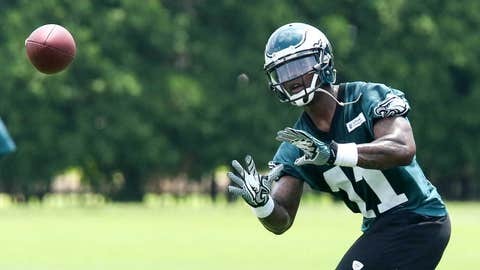 Is WR Josh Huff being phased out of the Eagles offense? What happened to Josh Huff's role in the offense? After making noise during the preseason, Philadelphia Eagles wide receiver Josh Huff has been quiet through the quarter mark of the 2015 regular season. Through four games, he has just four receptions for 39 yards. In Week 4, Huff played just four offensive snaps as he saw wide receivers Riley Cooper and Miles Austin split snaps at split end with Nelson Agholor taking the bulk of snaps at the flanker position. After showing promise in the preseason, it seems like Huff is going to need an injury or a few very strong showings during practice to make a move back up the depth chart. With Agholor, Austin and Cooper in the lineup, the Eagles finally created some chunk yardage players over the top of coverage, utilizing all three receivers.